for small business owners, the self-employed, farmers and entrepreneurs to speak for themselves to advance policies that are good for them and the communities they serve. Our Mission: The Main Street Alliance creates opportunities for small business owners to speak for ourselves to advance policies that are good for small businesses and the communities we serve. Who we are: Iowa Main Street Alliance is part of a coalition including Iowa Citizen Action Network. Our members are small business owners/ entrepreneurs/ farmers from across the state who are dedicated to giving a voice to small business. Trust & Transparency: Successful small businesses are built on the trust of our customers, where a handshake is a commitment. We advocate full transparency in our relationships with government. Inclusion & Equity: Small businesses succeed when communities thrive, and thriving communities are built on the values of inclusion and equity – where everyone is welcome, everyone is invited to contribute and everyone has the opportunity to succeed. Leadership: If small business owners don’t speak up, who will represent us? We speak for ourselves, so that the true voice of business will be heard. Small business owners need to be an integral part of the decisions that impact us. Sustainability: We build our businesses and communities not merely for short-term gain, but for the long haul. We recognize sound public policy as an investment that benefits our communities and businesses over time. Accountability: We work hard, our employees work hard and we make direct contributions to our communities (paying taxes) with the expectation that our contributions will be spent wisely. We promote fiscally responsible government that uses revenues to advance practical solutions to everyday problems. Shared Responsibility: We recognize the role of small businesses as part of the fabric of communities and we’re committed to giving back to our communities. We believe everyone needs to contribute their fair share. Unlike other organizations that tell members what they want, we LISTEN to our members and find ways to amplify their message. We want to get to know YOU a little better and hear directly what would be most helpful for your business AND we want to make sure you know just what it is we do. Join Now! 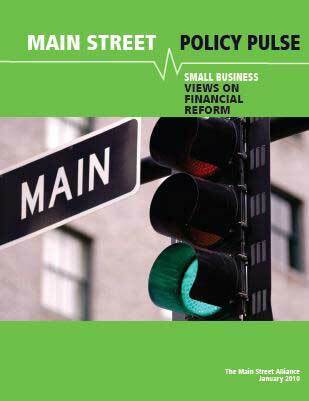 Help the the Iowa Main Street Alliance to get small business voices heard! Contact Sue Dinsdale if you have questions. As released in mid-July, ICAN and Main Street Alliance member ReShonda Young of Waterloo was invited to speak at a press conference on the US Capitol Steps in conjunction with Nancy Pelosi and other Democratic Women’s announcement of their economic agenda for women. ReShonda gave a woman’s perspective on the need for pay equity and a fair minimum wage. Read more …..
One of the health reform package’s benefits for small businesses that takes effect immediately – this year – is a new health care tax credit that will help small businesses save on insurance costs. Here’s a calculator to find out your small business tax credit. 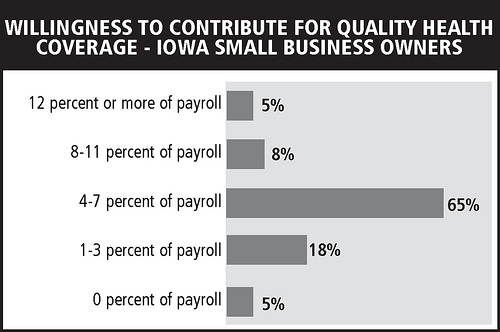 In Iowa, 101 small business owners participated in the survey on financial issues and financial reform. Respondents overwhelmingly believe that Congress should pass strong financial reforms, financial reforms are needed to ensure accountability on Wall Street, promote fair access to credit for small businesses and prevent another collapse. They also support creation of a Consumer Financial Protection Agency to supervise all bank and non-bank lenders. They believe that the CFPA would help small businesses by ensuring access to credit on fair terms and making sure all lenders are playing by the same rules. Fact Sheet (PDF): $146 Million of ‘Shoe-Leather’ to Kill Consumer Protection? Six trade associations representing Wall Street, big business, major banks and mortgage lenders, and the consumer credit industry are planning an all-out assault on the creation of a Consumer Financial Protection Agency. 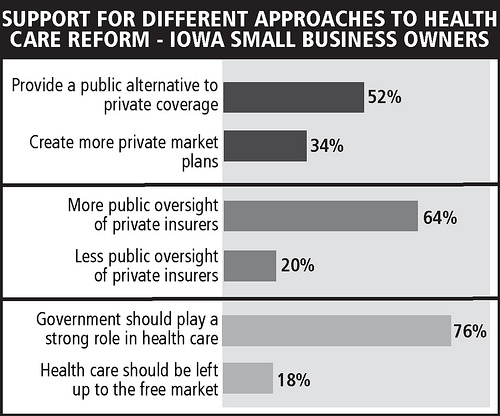 Small business owners are considered a key voice in the public dialogue over health care reform. But where do small business owners stand on the issue? 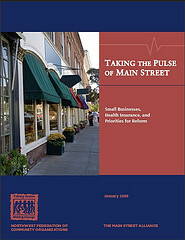 Taking the Pulse of Main Street reports results from a survey of 1,200 small business owners’ experiences with health insurance and perspectives on different reform proposals. 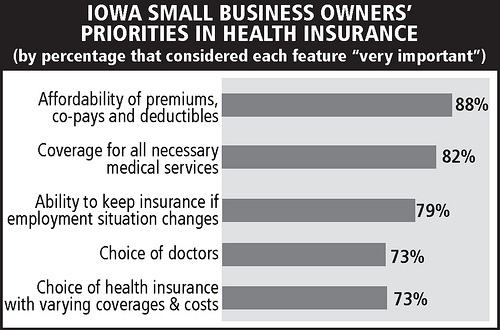 The results show small business owners want real health reform, are willing to contribute, and want the choice of a public health insurance plan. YES, I’ll sign on to the letter to end the special tax cuts for the top 2 percent! We, the undersigned business owners, executives and investors call on Congress and President Obama to let the Bush-era top bracket tax cuts for those with taxable incomes over $200,000 (individual) and $250,000 (couple) expire no later than Dec. 31, 2012, as now scheduled, without another extension. As small business owners, we urge you to end the special Bush-era tax cuts for the top 2 percent of income earners, or household income over $250,000 a year. This is the right thing to do for small businesses, our local economies, and America. The debate over the Bush tax cuts has been clouded by claims that ending special breaks for the top 2 percent of income earners would impact many small businesses. As small business owners, we know these claims don’t square with the facts. In reality, only a tiny fraction – roughly 3 percent – of all American taxpayers who report any form of business income on their personal tax returns would be impacted by a change in tax rates for income over $250,000. Even this small fraction includes hedge fund managers, high-powered corporate lawyers, and K Street lobbyists, so the number of real small businesses affected is even fewer. Furthermore, the “trickle down” theory used to justify extra tax cuts at the top simply doesn’t work. When the Congressional Budget Office examined close to a dozen options to jumpstart economic activity and job creation in early 2010, it found that extending special tax breaks for the richest Americans was the least effective of all 11 options for creating jobs and boosting the economy. Finally, claims about how ending these special tax cuts will impact job creation ignore the most basic fact about what drives small business hiring. Customers drive small business hiring, not tax cuts. We hire when we see opportunities, when demand exceeds the capacity of our current workforce, not because of a tax cut on our take-home income. Small businesses need more customers. How do we get there? Build roads and bridges, invest in education, hire teachers and first responders – this will create local jobs, inject money into local economies, and bring more customers into our businesses. But we won’t have the resources to do these things if we take the nearly $1 trillion we would raise from ending the extra tax cuts for income over $250,000 and hand it right back in another giveaway to the top. We urge you to stand with real small businesses and end the special Bush tax cuts for the top 2 percent.